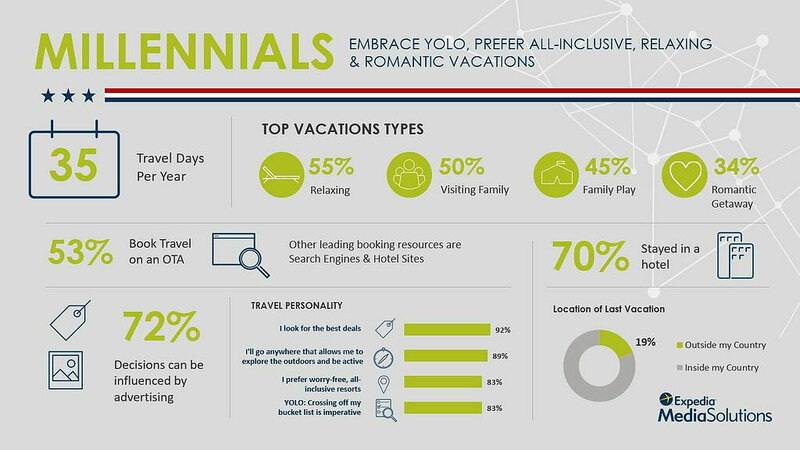 Millennial travelers in the U.S. embrace the ‘you only live once’ (#YOLO) mentality, take risks, and focus on crossing things off their bucket list, while Gen X prefer relaxing trips and visiting family. The findings, from a survey we conducted with Northstar Research Partners, illustrate the distinct shopping habits, influences and motivations of travelers across four generations, including Generation Z, Millennials, Generation X and Baby Boomers. Across all generations, Americans are open-minded travelers who are deciding between two or more destinations and seeking help and inspiration during the travel planning process. Included below is a snapshot of each U.S. generation, including their travel habits and influences. For more findings on their shopping behaviors, and best practices on how to reach each generation through digital advertising, you can download the study . 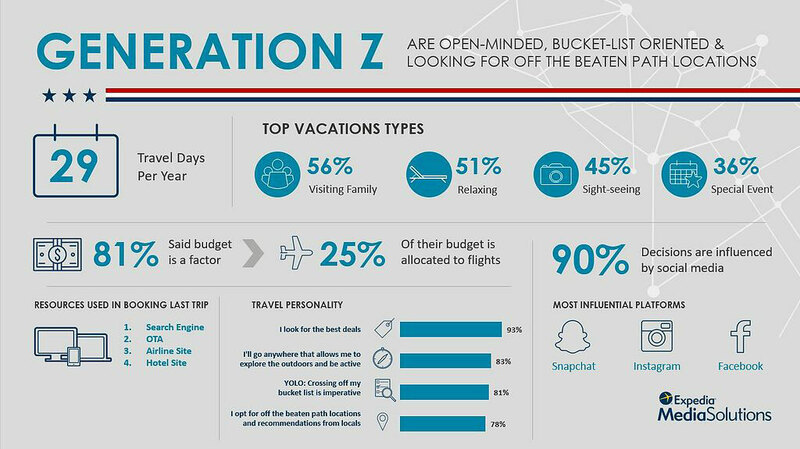 Gen Z travels 29 days a year and although they have a budget in mind when planning a trip, they invest in travel, and are more likely than other generations to travel internationally or for a special event. They are avid outdoor explorers and only one-third of Gen Z travelers have a destination in mind when they begin the research process. Nearly 90 percent of Gen Z travelers said their decisions are influenced by social media, either through searches or online connections such as family and friends. Millennials travel more than any other generation (35 days per year) and are more likely than other generations to be influenced by advertising during the decision-making process. They enjoy a wider variety of trip types, including relaxing at the beach or a resort, visiting family, sight-seeing, romantic getaways, and Bleisure. Similar to Gen Z, Millennials are #YOLO adventure-seekers; eight in 10 are looking to explore the outdoors and opt for off the beaten path destinations. However, unlike Gen Z, Millennials are also focused on relaxation: 83 percent said they prefer all-inclusive, worry-free vacations, and 75 percent said they’re all about taking a nap on the beach and indulging in spa treatments. 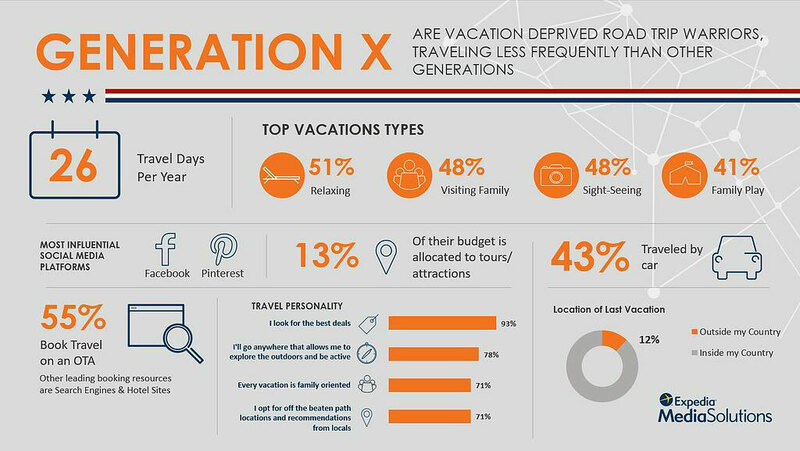 Family-oriented Gen X travels only 26 days per year, less than any other generation, but they spend more on hotels and prefer relaxing trips, sight-seeing vacations and visiting family. 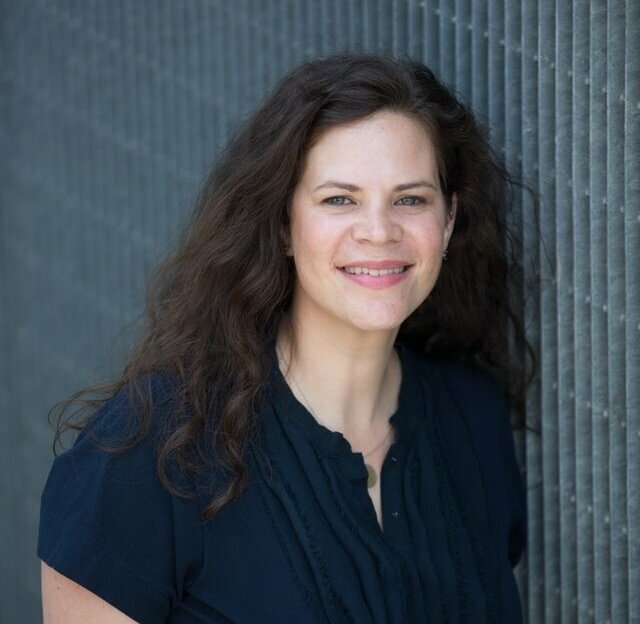 About 90 percent of Gen X said they look for deals and read travel reviews before making a decision, and 88 percent said informative content from destinations and travel brands can influence their decision. 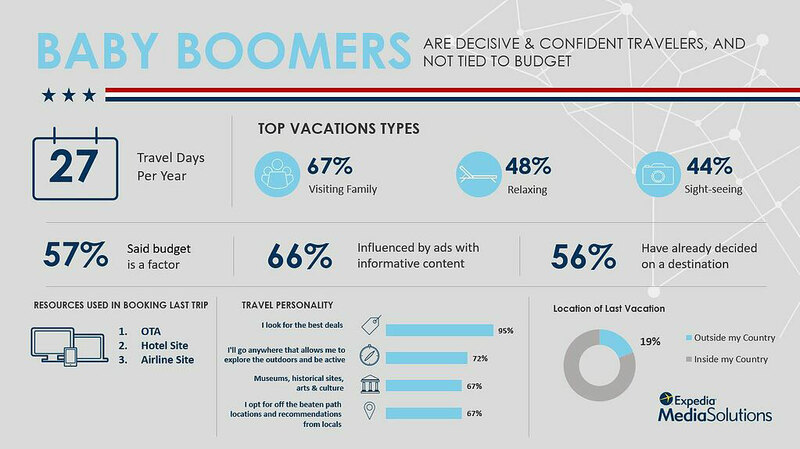 Boomers travel 27 days per year and are heavily focused on visiting family, so they know where they want to go and how to get there, which makes them seem more predictable than other generations. However, they are less likely to be tied to a budget than other generations, and when not visiting family, they fill their itinerary with museums, historical sites, arts and culture and recommendations from locals. Less budget driven than younger generations, fewer than 60 percent of Baby Boomers said budget was a primary factor when planning a trip. This is likely why 66 percent are influenced by ads with informative content, compared to about 60 percent influenced by ads with appealing deals.